Share the post "Podcast Episode 18: How to Network Like a Ninja"
Networking. It might not be your favourite thing, but it’s pretty much essential for any freelancer. In this podcast episode, Lorrie and I talk about why networking is important, and how best to go about it. Like a ninja, obviously. Episode 18: Networking like a ninja! LH: Today we’re talking about something that doesn’t seem to come naturally to a lot of writers and copywriters, and that’s face-to-face networking. Even if you’re not a natural networker, it’s a really valuable skill to have and one you can learn and improve on as your business grows. By following a few easy rules – and we’ll cover these in the course of this podcast – you can turn networking from what’s basically a necessary evil into something that really works for you and your business. PW: Networking is not my favourite thing, I find it awkward, and getting the right line between self-promotion – which is pretty much why you’re there – and not being pushy – which puts people off – is hard. Because I’m so averse to being pushy I have a really bad tendency, at networking events, to make polite conversation, listen to what other people have to say, and do a very poor job at marketing myself. However it is something I’m constantly working on. I go to these things fairly regularly – at least partly so I can improve – and also, because it’s actually pretty vital as a freelancer, especially if you primarily do commercial copywriting. LH: It’s interesting that you say that you go to them for practice, because it’s very much like going for an interview just for the experience. Networking events can be quite daunting, and what you mentioned about going along but just listening to other people is exactly the kind of thing this podcast episode will hopefully help our lovely listeners to avoid. There’s no point going to a networking event if you get there and find you can’t make it work for you. You really have to know how to ‘work the room’, to use a horrible bit of salesy speech there, you have to get in, get done and get out because other people are certainly going to. And yes, while networking might not be your cup of tea – it’s wasn’t mine at first, but I’ve got used to it really – but it’s hugely important for a number of reasons. PW: One thing that’s really important is that, going into these events thinking, “I must sell myself!” is obvious and offputting. It’s important to let others talk too, and listen. If you go in and say, “Hi, I’m a copywriter and I can write your website for you!” and they’ve just had their website done, you’re of no interest to them. But if you properly listen to them talk about their business, you’re in a great position to identify what their needs are. So you can tailor your offerings to what they need. If they say, “I’ve had a new website done, but I’m wondering how to let the press know.” Then, you can talk to them about how good you are at writing press releases. So a good way to pitch yourself right is to listen first, then talk. LH: As long as you don’t both just listen first. Really quiet networking event! But no, you’re right, listening’s really important; people can tell straight away when you’re faking it – your eyes glaze over and if you’ve got nothing insightful to offer by the time they’ve finished speaking, they’re going to know you weren’t listening. One thing I would add is that, as a copywriter, you ahev to be a good listener. The information you’re going to use is going to come from the client, so you need to be able to email or phone someone to elicit that information. So if you don’t listen properly at a networking event, you’re not setting yourself up for a good future working relationship with them. PW: You’ll probably get three sentences from them, initially, and you’ll have to fill 24 pages. So what you have to do is get good at asking the right questions and reflect things back, listening properly until they’ve said everything you need to know. It’s quite a difficult skill to develop but it’s a valuable one. LH: It makes people feel valued as well. It makes people feel like you’re investing time in them, and it’s great for building up trust at networking events. People like talking about themselves and they like someone who makes it easy for them to do that. No one wants to feel like they’re boring everyone silly. You don’t have to pretend to be fascinated by everything they’re saying, but if you’ve chosen an appropriate event to go to, you should know who’s going to be there and have done some research to ensure that you know what people are selling or producing, and to know where you’re headed in the room so there’s plenty of interest to you. PW: One thing that’s vital before attending a networking event is to prepare an Elevator Pitch. The idea behind this is, if you were to get into an elevator with Bill Gates, your elevator pitch is the perfect summary of what you do that would get you from the ground to the top floor in order that, by the top floor, Bill Gates would be investing in your business. This is basically a summary of your business and what you offer, condensed to the amount of time it takes to go up a building in a lift. If you can shrink what you do and what you offer into a perfectly worded 10 seconds, once you’ve mastered it, you have a really good place to start when face to face networking. I adapt and update my elevator pitch all the time. It’s a bit like my website – I’m never 100% happy with it but the more I use it and the more I practice it, the better it gets. At networking events, you need to make a quick impression at a networking event, so if you start by stumbling over, “Yeah, I’m a writer…what do I write? All sorts of stuff really, whatever you need writing I can write, and….” then people will lose interest straight away. They don’t have time to listen to you ramble. LH: I was like, “Business – same as everyone else! So yes, for me, confident delivery is everything. As we’ve mentioned before, there’s no shame in owning your own business, and owning the fact that you own your own business. You’ll look unprofessional if you get blushy and worried about describing the services that you offer. Go in there, ignore your nerves and make sure you’re well prepared. PW: If you want people to believe that you’re the professional you say you are, then you have to present yourself in that way. Another vital, vital point about networking events, probably the biggest piece of advice I can give you – trust me on this – is, well, go and listen to episode 14, “Mistakes We’ve Made”, and hear my awful error. Seriously. It involves foul language and a massive internal censor failure! So yes, if you just want one absolutely, “Don’t do this at networking events.”, go and have a listen. LH: It helped me, actually. I went to an event recently, and it was in my head the whole time. I was worried that it was going to be one of those things that was in my head so much that I’d actually end up saying it – but eventually, all was well, everything went well, and I have you to thank. PW: So, there are quite a few benefits of Networking Events and we wanted to talk about those. Firstly, they get you out and about. We’ve talked a lot about combatting isolation – we had an episode dedicated to that topic specifically – episode 11 -, and also it comes up regularly in other episodes – freelancers can get very isolated if they live and work at home. Even the most antisocial of freelancers needs human contact once in a while, and networking events are a good way of getting yourself out there. You meet other people who are self-employed and have the chance to promote your business and meet people who can help you too. LH: Yeah, I think this is another reason to research the events you’re going to go to – don’t just go to any. You’re supposed to enjoy yourself, at least a little – it’s not supposed to be Hell on Earth, you’re supposed to able to make valuable contacts and stretch the benefits out over the long-term. So if you really research, you can end making some really good contacts – people you’ll come back to again and again, people you can network with, collaborate with, share tips with – anything really. It’s brilliant for getting you out and about as long as you go to the right events. 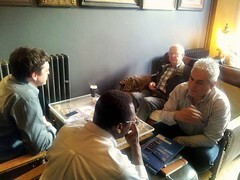 The second benefit of networking events we wanted to mention is that face-to-face communication is really powerful. It might seem sort of counter intuitive hearing a writer saying that, but it just changes things up really. LH: Haha, not my kind of event, but don’t let me judge! But yes, face-to-face communication does open channels that an email might not. PW: Yes, if they’ve just got an email from you, they can hit delete. But, if you’re there in front of them, unless they are a ninja networker with a wide array of violent moves, they have to listen for a bit, as Lorrie says! LH: This is true – they’re a captive audience, especially if you get them backed up behind the coffee and biscuits, or catch them while they’re behind their stand. They can’t just say, “No!” and walk away. This is why your elevator pitch is so important – it’s your ninja death star, and you can get your prospects quickly! PW: The third benefit we identified is that networking widens your exposure and increases brand awareness. People, especially business people, hear and see and read about lots of local business, service providers, whereas if they’ve met you a few times or gone home with your business card. If you then email them, they’re more likely to remember you. It makes your brand more sticky in their mind. LH: One thing I would add is that you should get yourself some lovely business cards. It’s really worth it, even just 100 to start off with. Get something really nice and hand it out – make sure you’re not shy about giving your card, shake hands with people, give them your card, because then people have a physical reminder of you after the day. PW: Another benefit of face-to-face networking events is that it’s more personal than a pitch email. You’re a lot more memorable if you’re face to face than if you just send out an email which could be from anybody. If they can picture you in your mind, it humanises the person behind the pitch. LH: Definitely, and it taps into what we said about listening to people when you meet them. If you pay attention, shake hands, make good eye contact, give open body language, or give your number, or arrange a coffee, they’ll remember you. There are lots of things you can do by email, but these aren’t those, so change things up. PW: Definitely. When someone’s in front of you, you can respond to them a lot better: if they look bored, you can change tack. If they seemed bored but perked up when you said something in particular, you can work out that that’s what they’re interested in. They’re more likely to remember you as a human rather than an email, and to remember that you were talking to them personally. LH: That’s it – it’s great when you’re face to face with someone to talk about how your services can help their business success. PW: Yes, and that doesn’t mean telling them about everything you do. It means listening to them and spotting what they need. LH: Yes, otherwise, it’s overwhelming. So, the fifth benefit of face to face networking is something we’ve touched on already, and that’s that your audience is more receptive: people are actually there for that specific person – they’re not sitting down having lunch when they receive your email; they’re not having a coffee when you give them a sales call. You’re all there for the same reason. PW: Yes, people go there knowing that they’re going to promote their work, but also knowing that other people will be promoting their work as well. LH: Do you know, the last networking event I went to, I went with a friend and client. When we got there, we homed in on the biscuit and coffee station because that’s where everyone wants to be. We started doing the rounds, after a while, and we came to these two tiny men, gripping a table and looking terrified. I went to them and I was chatting to them, but they were like rabbits in headlights, so I started out with a “Tell me about yourselves!” kind of opener. One of them looked at me and said, “Oh no, you’ll have to talk to him about that!”. The other one, his eyes sort of rolled back in his head and he gave me a huge long list, and I tried to get some interaction going, but he was unstoppable. There was no reason for me to be there at all, and that’s someone who really wasn’t receptive, but only through terror. PW: I’ve met loads of people who just list what they do, or the history of their company. The last event I was at, I got talking to this guy who was saying, “Yeah, I do this, and in 1980, we opened, and in 1984, we changed premises, and then in 1992…” and I was just standing there, not knowing what to say. And even I’d had something to say, he wasn’t up for listening. All the way through, I was wondering what I could offer him, and there was nothing! LH: A pillow and a brandy! PW: He didn’t have a website or any written material, so I clearly can’t help him. LH: I suppose it’s a point though: you stood there and listened to him, which proves how receptive the audience is – especially British people. PW: It’s true! I stood there for ten minutes and said barely 20 words. It was hard work. LH: Yeah it sounds it – and I suppose it takes us neatly on to benefit six, which is that networking helps you hone your presentation and verbal communication skills for a change. Because obviously, what we normally work with is the written word. PW: When you’re used to doing most of you communication in a written way, you get used to being able to edit things or coming back to things – or even nipping on to Thesaurus.com. You get used to having time to think things through. When you want to be impressive verbally, it’s quite a different set of skills. PW: Yes, and just be a lot more spontaneous. LH: I don’t think a lot of clients realise what a massive gap there is between written and verbal communication. While you might be very comfortable with one, ie. Written communication, verbal communication is very different. I can go a whole day without speaking if I’m alone in the house. So yeah, getting your presentation skills sorted and boosting your verbal communication skills, it’s a great opportunity. PW: Yeah, and most of the people you’re with aren’t master after-dinner speakers, so they won’t worry if you stumble over a word. So it’s a good way to reminding your brain to be quick, persuasive and to do it without planning. LH: Good point. And face-to-face, you can smile if you forget a word, or say, “You know what I mean” and rescue the situation with visual clues. PW: Definitely, definitely. The final benefit that we thought of was, actually, as well as meeting people who might want to hire you, you can also meet people you could work with too. I know Lorrie’s having a website redesign at the moment. You might go to a networking event and meet a designer. Or you might need a lawyer and meet one there. There’s a good chance that you can meet people who offer those services at a networking event. LH: I tend to find, actually, that graphic designers, web designers and software designers networking in a very similar way to copywriters. Although we deal with different things, I think we’re a similar breed. But it tends to be quite a friendly networking experience, dealing with designers in particular. The way of working is quite similar and it’s quite beneficial to make these contacts, actually, as writers often need to recommend designers and designers often need to recommend writers. LH: One thing I would say, and it comes from personal experience and personal frustration is that you should only really make connection with people you’re interested in. And when you do make good contact, honour that with an email or phone-call. PW: Yes, don’t be tempted to blast an email out to all 38 people you met saying, “Hey, great to meet you yesterday, hire me!” – it doesn’t work. It’s good to take it easy, though – suggest coffee or a working lunch if you need to chat more. If they’re further away, a Skype call might be the way forward. Reconnect with them! PW: Definitely. It’s also important to remember that you might meet someone and think they’re perfect, but they might not remember you as well – so give them a little prompt about who you were and what you discussed. It’s not personal, it’s not that you did a bad job, it might just be that you weren’t immediately what they were looking for. Something I do, immediately after the event, is to write a note on the business cards I’ve collected – usually the date and where I met them, but also any other pertinent points that you might want to remember. You might think you’ll remember, but a week later, you don’t. LH: I always think after events, that I’m going to start an excel file and type all the info in, but do you know what, that’s what business cards are for! Get a box, put some dividers in there and, as Pip says, put some notes on the cards and keep them in one place. PW: I know some people swear by these phone apps where you can take a picture of the cards with your phone – it can extract the info and store it all, so if you want something more hi-tech, it’s worth looking into. LH: I suppose even without an app, you could keep jpgs on your computer. A bit of a faff for me, but it could work. I think I’d sum up about business networking events by saying, “Don’t be fake.” Don’t fake interest in people, don’t waste people’s time. Not everyone’s going to hire you, so choose your targets. PW: Similarly, don’t feel obliged as though you’re going to hire someone if you’re not. LH: True – you can be friendly and receptive, but let people know that, you know, “Thanks for your time, not really something I’m looking at at the moment. Don’t say you’re interested in hearing from someone if you’re not; don’t say you’ll contact someone if you won’t. PW: And be aware that the things you might get out of the event might not be clients – there are all the benefits we mentioned above. Even if you go and you’re rubbish, you’ll be better next time! A few weeks ago, we started the Little Bird Recommendations, in which we both share something worthwhile with our listeners every week. So, my Little Bird recommendation this week is a blog post. Quite often, if you submit work, you can be really confident with your a magazine article or a short story, the editor will nonchalantly add, “Oh, and send a photo and a short bio too, ok?”. I don’t know what it is about the words short bio that strikes fear in the heart of many writers, but lots and lots of people do find them incredibly difficult to write. Similarly with “about me” pages on your website. So my recommendation is a blog post entitled Writing About Yourself When You Hate It and it’s from Angela Booth’s Fab Freelance Writing blog, but don’t worry about remembering that, just check the show notes and there will be a link there. She gives some great advice about how to write about yourself, specifically to do with author bios, and anyone who finds themselves cringing when asked to write one should find it really useful. 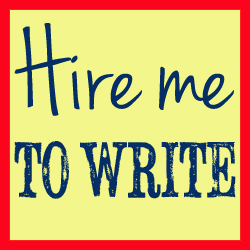 LH: I’ll certainly give it a look – I often have to send them with my creative writing. PW: Yes, it really does strike fear into people’s hearts – considering you’ve just written 2,000 words for someone, it’s funny that another 75 is so scary! LH: I think it’s easy to be contrived when you’re trying to write an author’s bio. I can only speak from a creative perspective, really, but it’s difficult. It’s very much like trying to be taken seriously with your business: you want to be taken seriously as a writer, but creative writing can be quite embarrassing in a way because it’s quite intimate. You want to come over as someone who’s seriously a good writer, because you’ve been published, so you must be quite a good writer, but at the same time, you don’t want to take yourself to seriously, so here’s a funny anecdote about me but, OH GOD, what if they don’t find it funny? What if they think I’m a loser?! LH: And it’d gone to the owner of the intern, who reviews all the submissions personally. You’re not really showing much faith in the journal you’re submitting to, but nice attempt at humour! The guy who runs the journal is really nice, actually – we were chatting on Twitter and he really didn’t know what to do with it! But yes, a blog post about writing about yourself when you hate will, I’m sure, be an absolutely God-send, and I’ll certainly have a look at it. PW: Well, the link’s in the show-notes! LH: Haha, thank you! My recommendation this week is kind of the opposite of Pip’s, for me – it’s something that doesn’t come that naturally to me, and that’s direct marketing copy. I love creative writing, but this stuff isn’t my cup of tea. So, my recommendation is for copywriters who write for the web – particularly those who write direct marketing copy or sales pages: it’s called Unbounce.com, and it’s the blog that’s a treasure trove for copywriters. There are loads of articles on there on how to create brilliant landing pages, very regularly updated, on how to optimise your SEO, and loads more. The emphasis on the blog tends to be on conversions – ie. sales, so it’s a great place to go to improve your skills in persuasive sales copy. It’s quite a hard topic – direct marketing copy actually looks really bad – it’s the kind of stuff that looks so bad that it’s good. PW: I think most copywriters will be called on at some point to do direct marketing copy and it’s a really specific skill – you can just guess it, and think, “Oh, this is persuasive.” – there’s almost a science to it, and you’ll need tips. Any copywriter could really benefit from having a look at this site. LH: Yes, more than just tips, you’ll need a recipe! Everything on a sales page – the headings, the sub-headings, the font, the font size, the images, the captions…who would think that the captions were the second most important thing on the page? PW: Yeah, a lot of it is quite counter-intuitive. You’d think that surely the colour of the ‘buy now’ button would be the last thing to matter, but you’d be wrong. It goes to show that on a sales page, everything has to have a purpose. Through really studying how to convert from experts, you can make every word in your sales copy do a job. LH: Definitely, so my recommendation this week – in which I’ve been doing loads of sales copy – is undoubtedly http://unbounce.com/blog/. It’s brilliant for improving your skills in persuasive sales copy, it’s great if you’ve just got five minutes, it’s brilliant. PW: Sounds great – just as you’ll be checking out my recommendation, I’ll be checking out yours. So, we hope that this episode will help you to approach your next networking event with a ninja mentality. I’m not sure how well that really flows through the theme, but we like and it’s alliterative, so damnit, we’re sticking with it! Hopefully this will push you to attend your first event, or to get a better result if you’ve already been to a few. LH: This is it! Be a ninja, get the results you want. Get people with your elevator pitch and don’t let them escape. This will help you improve your skills, and it’ll get you out of the house. Get yourself on eventbrite.com, which is great for free events, so have a look. Usually, these events have social media pages, so get researching, prepare for them, go along and use the tools from this episode to make the most of them once you’re there. PW: Go to alittlebirdtoldme.podomatic.com and subscribe by RSS or on iTunes or on Stitcher Smart Radio. We know we’ve got some brilliant listeners because we get brilliant feedback on Twitter, but our Facebook page is a bit lonely! LH: and we’re ninjas – we can find you. So subscribe, please! PW: And then, because I’m feeling demanding, you should tell your friends. You can embed this podcast on your website – that would be ace! LH: Give us a Christmas present, come and say hello!